It’s been a while with the boba or bubble tea trend, so you might have heard or even try them. The trend is still hot, or cool for this year, and guess what, it’s even better to try it now. So easy to make, get your kids or teen in for help and they’ll enjoy it even more. The drink is just the normal milk tea, enhance with your choice of flavor. I used Jasmine buds cause that what’s I have on hand, but you can choose anything, or skip that. 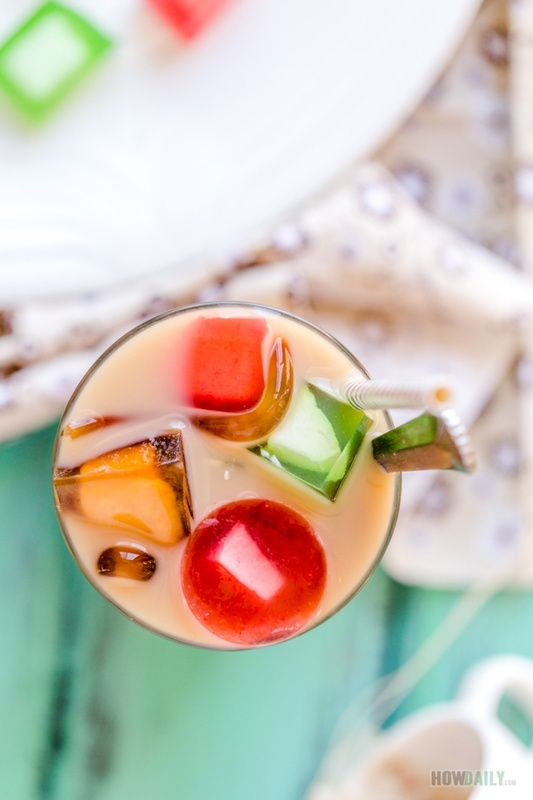 What’s make this drink so fun and attractive is all the topping variation. There are loads of topping that would go good with milk tea. Fresh fruits like strawberry, kiwi, grape, avocado, dragon fruit, jack fruit…are perfect pair. 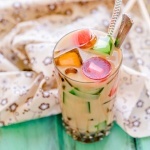 Then there are complements like dark boba (pearl bubble), crystal pearl, jelly noodle, coconut jelly, etc. and now it’s the cream cheese jelly. They all could go together as a blended fun drink, or single handy. 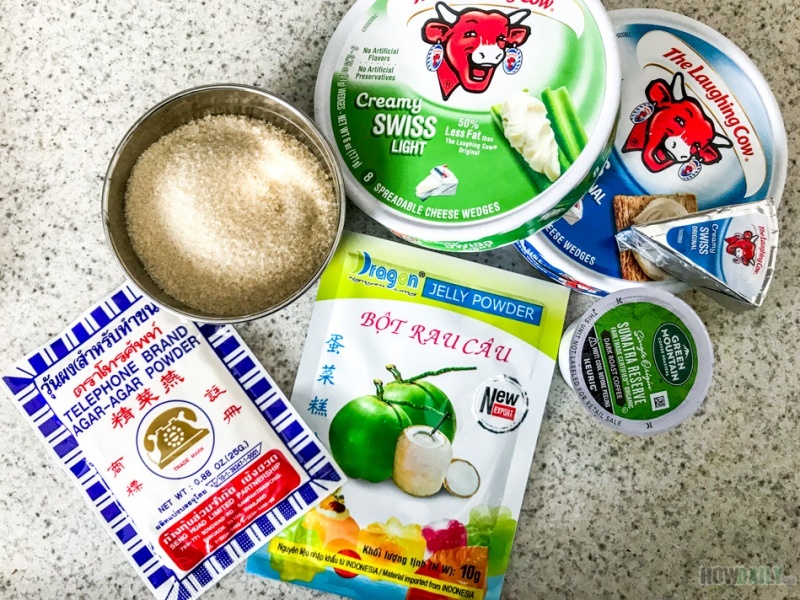 To make good cream cheese jelly, I used cream cheese wedge original Swiss flavor from laughing cow. That was the brand that I grew up with, and now they’re making more and more flavors and in cubed style too. You could pick just any flavor or use your favorite cream cheese block. Another note is on the jelly. There are many types that you probably familiar with. One is Agar Agar powder, those usually sold in small packet of telephone brand. Then there’s the normal jelly powder where you would use to make jello. Here’s the thing, Agar tends to make firm/crispy block and hold shape quite well. Jelly powder, when cooked, tends to be more flexible, pliable and easy to sip through a straw. 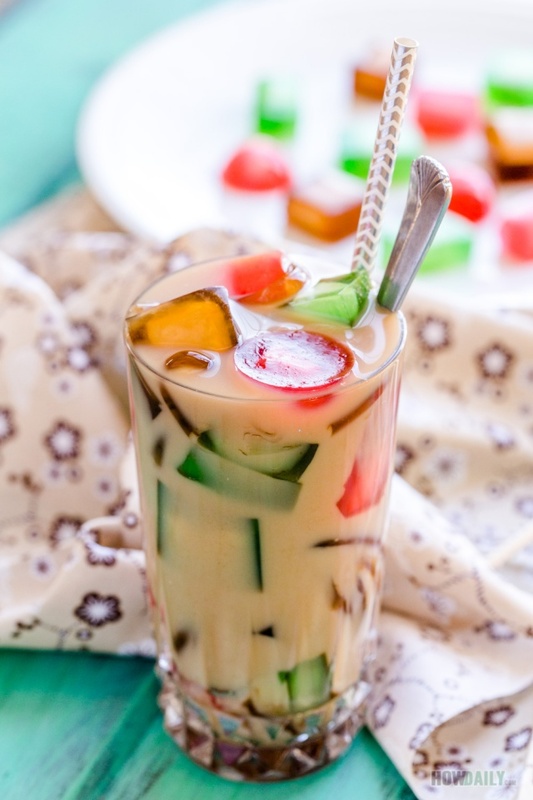 So for this cream cheese jelly, we would want something that is soft, pliable to go through the giant straw, yet whole it shape with all the beautiful colors. That’s why I do a mix of about 7 to 3 of agar and jelly powder. You would need a kitchen scale for precised measurement, as these powder will give large quantity different when mixed with water. Another note is on the jelly/jello flavors. Since cream cheese is cheesy (of course), we would want the jelly taste to be mildly sweet with a hint of bitter (coffee, chocolate, cocoa) or sour (orange, lemon…) to balance them out. Our milk tea already sweet with condensed milk, so surely these contrast flavored jelly would stand out and give the perfect balance. So, for the next fun party, try these drinks enjoyment for the kids and teenagers. Girly twirly sweet with this delicious yet appealing drinks: the cream cheese jelly milk tea. Derived from the infamous boba or bubble tea, this is just fun with all different flavor while being cheesy also. Fabulous in summer, yet perfect in winter too, cause you get to skip that extra ice. Flavor choices coffee, orange juice, matcha, grape juice, etc. Chill cream cheese in fridge to harden them up before cutting. Cut cream cheese into smaller chunks. Add 4 cups of water, 100 grams sugar, agar and jelly powder to a small/medium stock pot. Try to be precise as small amount of agar/jelly powder would create large quantity. Stir and twirl until all sugar/powder fully dissolve and let sit for 5 minutes. Place this pot onto medium heat, keep stirring to prevent overflow for 3-5 minutes. When hot (solution start bubbling up), reduce heat to warm setting. Mix 1/3 - 1/4 quantity with a desirable flavor fluid/powder. Ladle into mold, wait a couple minutes to harden up, add cream cheese then ladle till full. Repeat with other flavors. Remember to stir before ladle out, heat up if necessary to thin them out for easier handling. When all molds are cooled to room temperature, chill in fridge for 1 - 2 hours. Heat water, add a couple jasmine buds (for aroma). When water is boiling, remove from heat and pour into mug. Throw in a tea bag, sip for 10-20 minutes or per each kind instruction. For each cup stir in a Tbsp or two of sweeten condensed milk, until desire sweetness. Chill in fridge until serving. 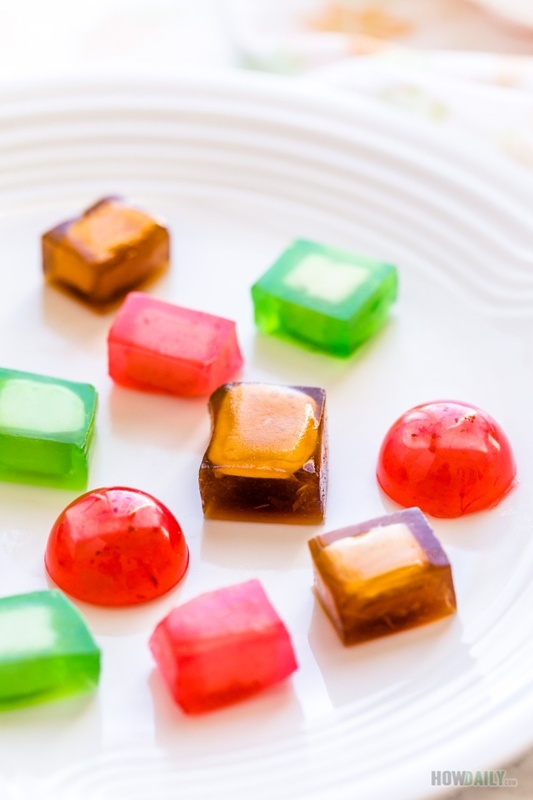 For each cup of chilled milk tea, add some cream cheese jelly cubes to serve.